Mount Edgecombe wedding venue is where natural aesthetics and South African hospitality combine to make a magical place to tie the note .Majestic cuisine, casually elegant lodging accommodations and a staff dedicated to fulfilling your every desire concerning your wedding venue ensures that your wedding will be everything you've hoped for. This wedding venue will leave friends and family talking about your wedding for years to come. 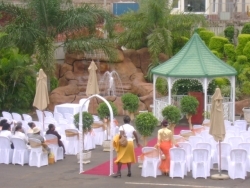 A Function held here at the Mount Edgecombe Conference Centre is always a unique experience for everyone attending. 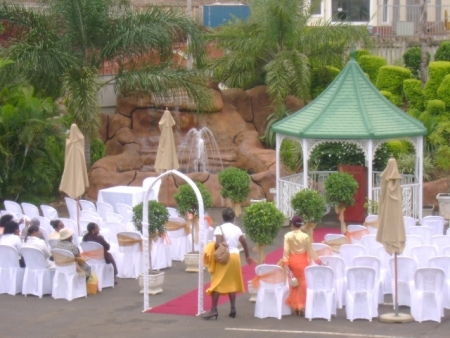 We offer more than just a quality stand alone venue – we offer a fully equipped centre from draping to table décor. Modern laser lighting , projector screen , follow spot lights , and other optional extras is a must for every occasion. Events from elegant and memorable weddings , Birthday parties , Conferencing , Road shows , award evenings and Corporate functions , we do them all. Our main venue seats between 250 – 450 banquet style seating and up to 700 cinema style seating. We are proud to announce our extended room upstairs is now a 140 seater.This is a fully air-conditioned venue.